The 100 forces the characters to make decisions that will fundamentally change long established relationships as various conflicts escalate beyond the point of no return. There’s a lot to keep track of this season in terms of loyalties, power struggles and general plot minutiae. You’d be forgiven for getting confused by the white noise of these elements clashing against one another. This episode in particular struggles with how much is going on this season and highlights that some things should start building to a resolution. Individually these things aren’t necessarily bad but cramming too much into a short season can be detrimental to the overall experience. For me the most interesting thing at play is the dynamic within Wonkru. Octavia’s stranglehold on this group is equal parts fascinating and terrifying. The reasons for her lack of empathy and cut-throat attitude are understandable -even if we don’t know what happened during the often mentioned “dark year”- yet still concerning because she is not an effective leader since she doesn’t actually have the best interests of her people at heart. I’ve mentioned before that Octavia wants to win and sees her people as a resource that will allow her to do that. Compromise isn’t a word that exists in her vocabulary so she is unable to back away from a conflict even if it means that her people can live peacefully. Bellamy, Indra, Gaia and Clarke are the main opposition to that for their own reasons. Bellamy wants to live in peace and wants to see his sister return to the more compassionate person he once knew, Indra is motivated by wanting to protect her people as well as do what is best for Octavia, Gaia is very much about letting her culture live on and Clarke wants to live peacefully while protecting Madi. Having these different motivations in the mix is a good idea because it makes the situation complex and further highlights just how misguided Octavia is at least in terms of understanding what her people need from her as a leader. All four of the people mentioned have tried talking to her in one way or another and it has failed so they are forced to take action instead. Bellamy took action last week when he poisoned her to get her out of the way so that they could move against her. Indra tries to appeal to the people by selling the idea of peace and offering to lead them to a life free of conflict or hardship in Shallow Valley. Unfortunately for her enough of the people believe in Octavia’s leadership and were committed to joining her in the campaign to take the valley by force to drown out her voice with promises of victory and glorious combat. Mob mentality takes hold after that and Wonkru are more ready for War than ever. This tells us a lot about the current situation. Indra talks talks genuinely about how dear Octavia is to her and how she feels that it’s her responsibility to take over leadership duties when Octavia is unable. Despite this she still openly disagrees with Octavia about what their priorities are and how they should be managing the current situation. The reaction of the people tells us that Indra had a misguided outlook on how people were feeling about Octavia’s leadership. The unwavering loyalty to her desire for War comes as a shock to Indra and it’s clear that she has no idea how to react when her desire for a peaceful resolution isn’t shared by the people. In a way this solidifies Octavia’s rule as it turns out she is giving people what they want. This won’t be true in all cases because it is clear that mob mentality is at play here as I said but the situation can’t be simply defined as Octavia using her people to further her own agenda at their expense. Beneath the surface level conflict there is tension that owes itself to years of character development and a naturally built shorthand between these two characters. It’s well known how much they trust one another and how high their opinion of the other is. The tension comes from Octavia feeling betrayed by Indra and telling her that she’s ashamed of her. 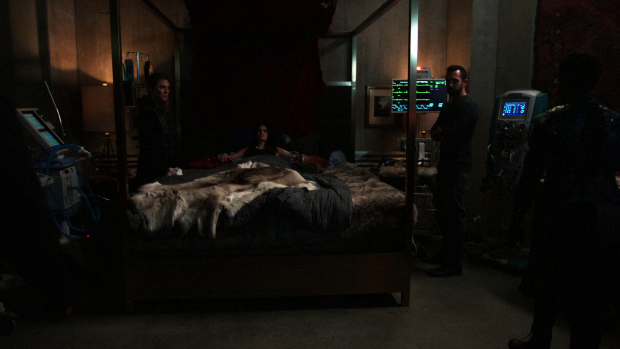 This is countered by Indra saying that she’s scared of what Octavia has become. Something profound has been lost between them and Adina Porter’s performance captures this perfectly with the tears in her eyes conveying that there’s no going back for either of them. 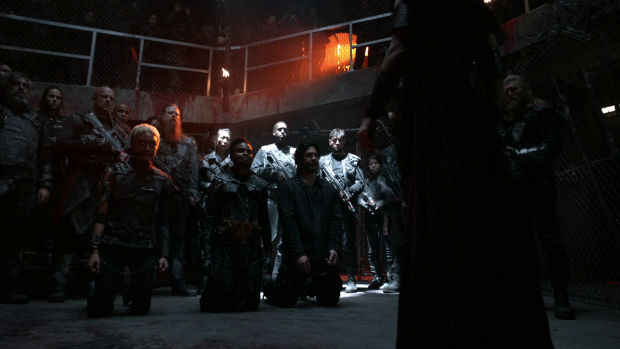 Still Indra sticks to the plan because she recognises that Octavia is something that needs to be overcome. When Indra fails it’s decided that Wonkru need a commander that they will follow without question which means that they need a true Nightblood. Even though the Wonkru philosophy is supposed to be what the people are living by it’s difficult to counter generations of belief and tradition so Nightbloods are still very important to a large chunk of the population who are predisposed to follow the keeper of the flame. The only candidate at this point is Madi which is problematic for all sorts of reasons. One of these is that she’s very young and clearly unprepared for this responsibility so it’s hard to manage a scenario where she would be able to lead effectively. NAME’s performance shows how reluctant Madi is to take this on as well so there’s clear apprehension to this idea from a number of people. It’s also very much the opposite of what Clarke wanted for her so she has a vested interest in preventing this. Clarke’s role in this manifests through her conversation with Niylah. She is able to exploit Niylah’s loyalty to Octavia in order to convince her to stop Madi from being given the flame. This is another case of Clarke using what she knows about people to manipulate them into helping her. It’s not at all insidious but in the case of Niylah she knows just what strings to pull to get her help. This also reinforces Clarke’s maternal relationship with Madi and how far she’s willing to go to protect her while also being blinded to the fact that she is making life choices on her behalf because she thinks she knows what is best for Madi. Whether she is right or not is irrelevant when considering that Madi should be the one to make those choices for herself. I found that Clarke’s decisions didn’t entirely ring true because it does involve her siding with both Niylah and Octavia while effectively writing off Bellamy to keep Madi safe. Her loyalty to Madi adds some justification for that though having her ignore her friends is a really bizarre choice. It might have made more sense had the decision been analysed to some degree but it isn’t. This is actually a persistent problem the show currently has when it comes to character decisions at the moment. They are often made without fully justifying them as something a particular character would make. Clarke apparently turning on Bellamy so easily is one such example. Bellamy poisoning Octavia turns out to be more serious than I had initially thought. The toxin she was exposed to is very life threatening and it’s possible that Bellamy might have to shoulder her death on his conscience. He lies about what happened and is clearly anxious when it looks like she might make up so he has crossed the line into territory where he is willing to sacrifice his sister for the greater good. Once again he is walking a moral tightrope but also shows conviction when it comes to justifying his actions. When Octavia wakes up it has about the effect you would expect. She recognises that her brother isn’t someone who will look out for her or have her best interests at heart any more so she defaults to the “you are Wonkru or you are the enemy of Wonkru” philosophy and treats him as she would anyone else she deems a traitor. This means that Bellamy is sentenced to fight for his life. On the surface this marks a complete breakdown in the brother/sister relationship but it’s far more complex than that as shown by the performances. Bellamy is clearly carrying around some guilt over what he did even if he does believe it was the right thing to do. 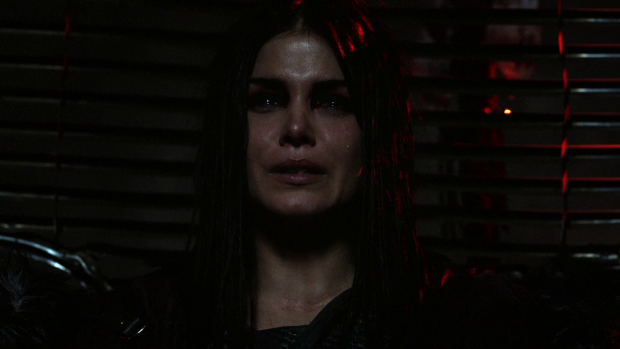 Octavia shows remorse over her decision in her private chamber when she cries. It’s the first sign that she is still capable of empathy suggesting that there is hope for some sort of redemption for her. It also shows that she’s torn between the rules she set as a leader and her relationship with her brother. She favours the example she feels she had to set over a familial connect. I suspect that Bellamy will survive but being close to losing him might be the turning point that she needs to learn that her fear based leadership doesn’t work any more. In Shallow Valley the prisoners have split into two distinct factions after the return of McCreary. There are those loyal to Diyoza and those loyal to McCreary with Murphy, Emori, Echo, Raven, Kane and -to an extent- Shaw stuck in the middle of it. Abby finds herself kidnapped for obvious reasons and McCreary shows himself to be a threat to everyone. Of course he is the father of Diyoza’s child which offers some distraction and represents a form of cooperation between the two factions but there also seems to be too much hatred for that to work effectively. The two factions delivers the perfect opportunity for Murphy to shine. He uses his ability to aggravate an already tense situation to great effect by causing a full on conflict between the two sides allowing those caught in the middle the chance to slip away unnoticed in the confusion. Emori points out that he’s doing what he does best and this is backed up by a very clear example once the fighting starts. It’s a small moment that means so much and makes great use of an excellent character. Raven seems to have calmed down on her desire to kill Shaw and the two of them have a really genuine moment that furthers the hint of the attraction between them. Shaw has a lot of potential as I’ve repeatedly pointed out and there is definite chemistry between him and Raven that is being explored gradually. Another strong episode that makes great use of the characters and the natural conflicts that exist between them. 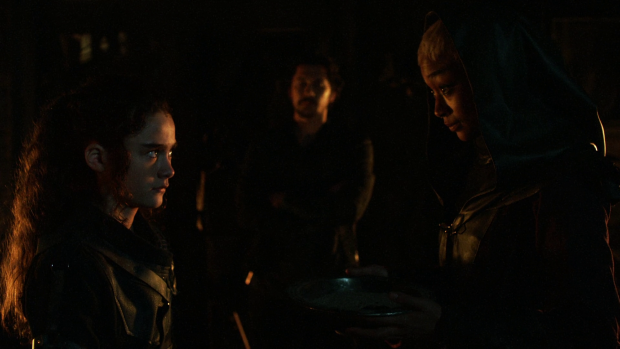 Indra’s decision to betray Octavia in the name of peace resonates powerfully throughout the episode because it’s clear that her decision was a difficult one punctuated by a great conversation between them highlighting betrayal and loss on both sides. Similarly Bellamy poisoning her even though he knows it could be lethal is a really nice touch because it shows he is willing to risk his sister for the greater good and further develops the breakdown in the brother/sister relationship. Octavia sentencing him to fight for his life shows that the reverse is true though we see the first hint of empathy from her this season along with the conflict between leading by example and loyalty to family. Clarke’s decision to side with Niylah and Octavia in order to stop Madi receiving the flame to make Wonkru loyal to her instead of Octavia doesn’t quite ring true because she abandons Bellamy in the process which is a really bizarre choice. With more time spent justifying this and pointing out that it wasn’t an easy choice it might have worked but it feels more plot convenient than character driven. 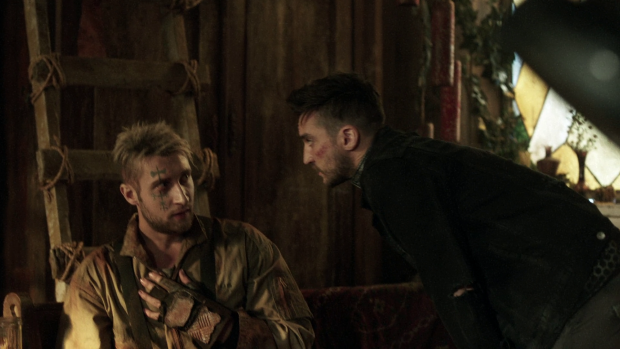 The two factions within the prisoners works really well with other characters in the middle because it allows Murphy to take advantage of the situation and cause the conflict to escalate. It’s a really good use of an excellent character.